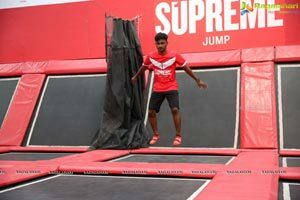 • SUPREME SPORTS STUDIO FEATURES A WORLD CLASS SPORTING COMPLEX WITH HIGH-END INTERCONNECTED TRAMPOLINE PARK MAKING IT NOT ONLY THE LARGEST PROFESSIONAL TRAMPOLINE PARK IN HYDERABAD, BUT ALSO ONE OF THE LARGEST IN INDIA. 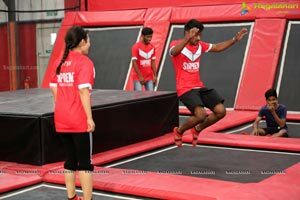 • SUPREME SPORTS STUDIO BRINGS ENTERTAINMENT, SPORTS AND FITNESS UNDER ONE ROOF WITH THE VISION OF MAKING HYDERABAD ONE AMONGST THE TOP SPORTING CITIES IN THE COUNTRY. 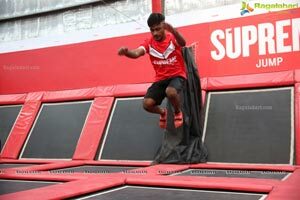 • SUPREME SPORTS STUDIO ALSO HOUSES THREE YONEX BADMINTON COURTS, BEACH VOLLEY BALL AND ADRENALINE PACKED 5-A-SIDE CAGED FUTSAL GROUND. 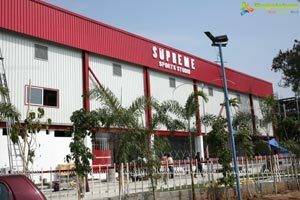 • SUPREME SPORTS STUDIO IS CONSTRUCTED WITH GROUND ENVIRONMENT FRIENDLY TECHNOLOGY WITH AMPLE AMOUNT OF GREENERY IN THE HEART OF THE CITY. 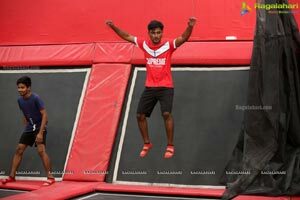 Hyderabad, 8th February, 2019: Supreme Sports Studio, a debut in the sports arena of Hyderabad with high-end Sports facilities and international standards initiates its operations at Serilingampally, Hyderabad on the 9th of February, 2019., Supreme Sports Studio is an exciting new recreational and upscale multisport complex for Adults & Kids introduced to the city by the sports enthusiast promoters that spreads on an area of approx. 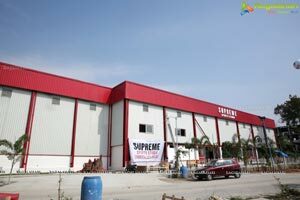 1 Acre land, located at one of the prime spots of the city at Serilingampally, Hyderabad. 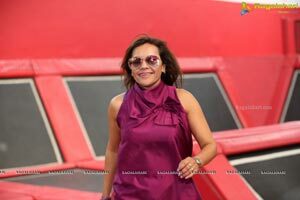 A uniquely conceptualized sports complex that has taken shape keeping in line with Telangana Government's initiative to make the city amongst the top sustainable cities in the country and accordingly is constructed with ground environment friendly technology with ample amount of greenery. 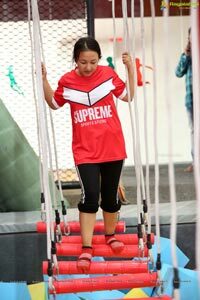 Supreme Sports Studio brings together entertainment, sports, and fitness facilities for the sports enthusiast in the city along with the introduction of the concept of Fun with Fitness with the aim of encouraging sports activities for a healthy lifestyle among all age groups. 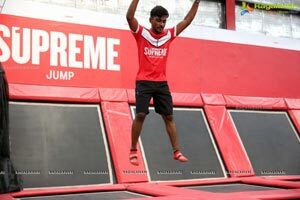 Supreme Sports Studio features a high end, interconnected Trampolines created on a 15,000 sqft area making it One of the largest Trampoline Facilities in India and also has the only Professional Trampoline in Hyderabad. 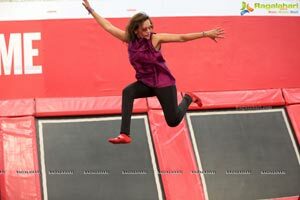 Trampolining is known to be a major fun sport across the world with health benefits matching or even better than many other physical activities. 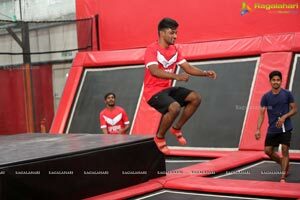 Trampoline keeps the fitness levels high by strengthening the bones, muscles and cells and it's proved that an hour of Trampoline burns 1000 calories and also boosts the metabolism of the body, increasing the blood circulation and reducing the stress levels. 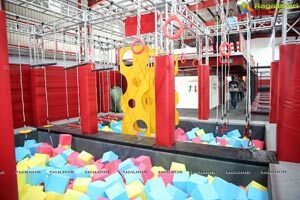 The Trampoline area is spread into eight different fun filled activities - The Free Jumping Zone, The Extreme Dodge Ball Zone, Climbing Wall, Trampoline Basket Ball (Slam Dunk), Airbag Zone, Professional Trampolines, the Slack Line and Battle Beam and the Ninja course. 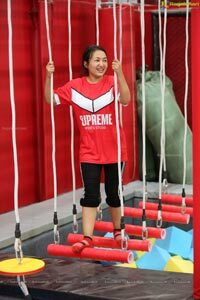 Supreme Sports Studio houses World Class Yonex Badminton Courts, Futsal and Beach Volley Ball too for a fun-filled day out. 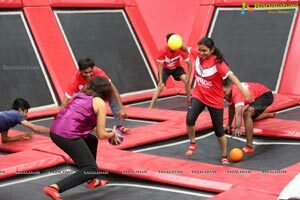 The complex also houses SUPREME Cafeteria, Birthday party rooms, Large banquet hall and few retail spaces are up for grabs, thus making this complex an ideal place for Birthday Parties, Corporate Events, Motivational Exercises and most of all a vibrant place to hang out with family and friends. 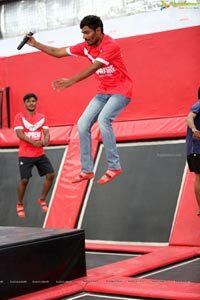 Suresh Yeraballi - Director -Supreme Sports Studio, stressing on the importance of fitness in India says - "Supreme Sports Studio is a dedication to community fitness and to all my fitness freak citizens, old, young and kids. 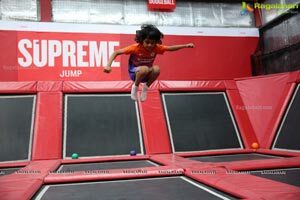 In today's gizmo world it takes a challenge to get kids out to the open for any physical exercise, so we at Supreme Sports Studio combined Fun 'n Fitness, which will not only encourage kids being outdoors, but will also keep the child alive in every adult and overall to make a Fit India.